Over the years, Dawoud Bey has examined the anxieties and joys teenagers have in common regardless of background, race, or gender, mostly through portrait photography. He began his career as a street photographer so his ability to spot the meaningful nuances of everyday life is a keen one, and he gets his subjects to open themselves to honest self-reflection. His new work, on show at the Art Institute of Chicago, is different. 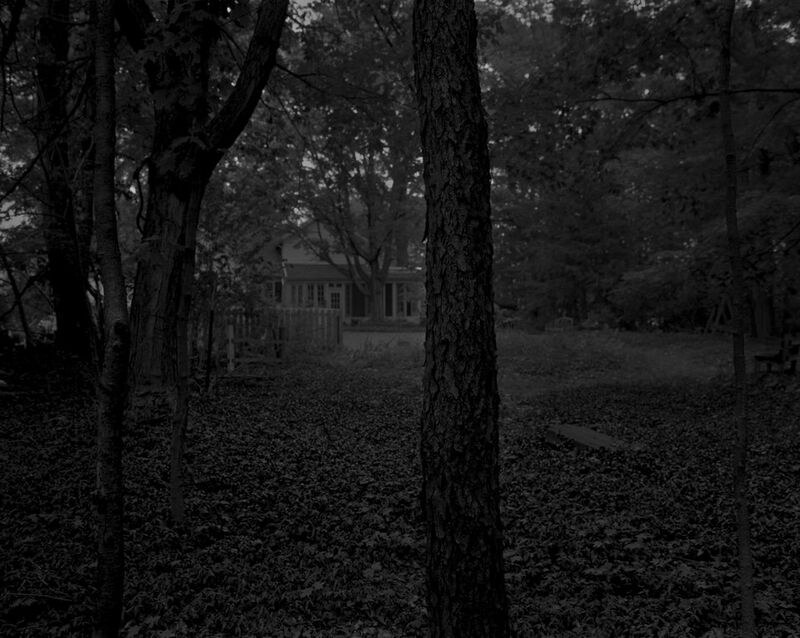 Night Coming Tenderly, Black is a portfolio of 25 large format photographs of views in northwestern Ohio that escaping slaves might have experienced along the Underground Railroad. All are nocturnes, since movement occurred almost wholly at night. They are also landscapes with no human presence. Bey shot the works in Hudson and Cleveland, Ohio, though the locations are more evocative than historically precise. He depicts thick brush, dark roads, unknown fields and swamps, unlit farmhouses and white picket fences. His settings are sometimes sinister, sometimes forbidding, sometimes inscrutable, and often lush and cocooning. 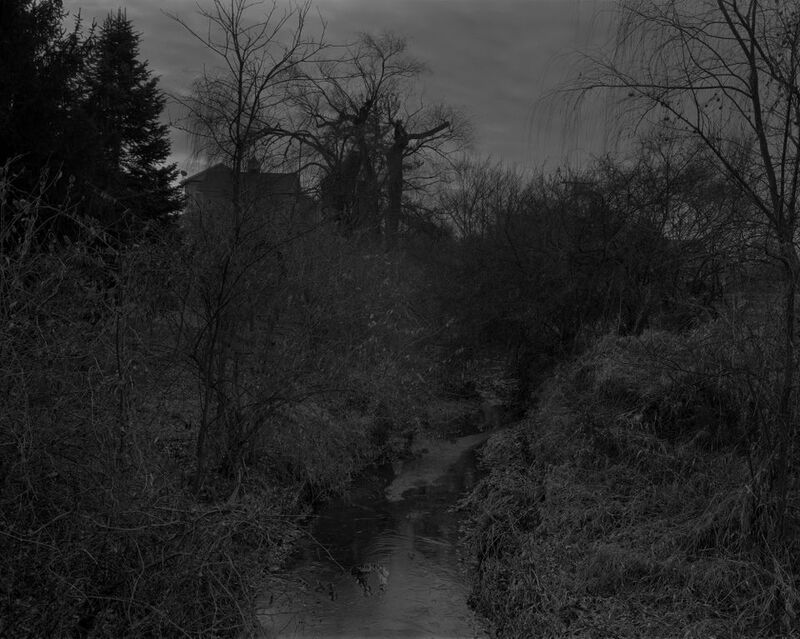 Whatever the mood, they demand that the viewer — the surrogate for the fleeing slave — puzzle out a way through the inky atmosphere and unfamiliar terrain. The photographs together tell a story of movement. 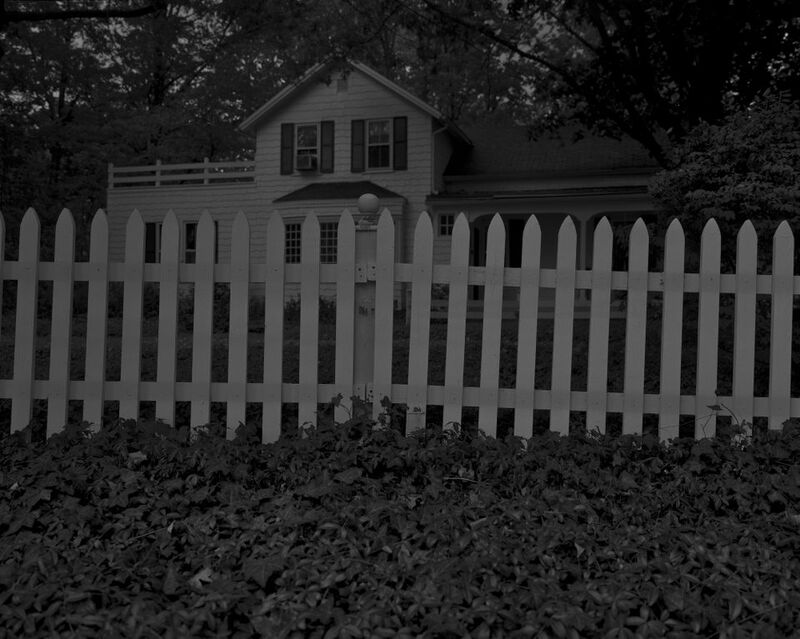 Steep diagonals and picket fences tell us to move along, but at the same time the pickets can look like a procession of ghosts or tombstones, itself an incentive to move faster, heart racing. A photograph of dense brush walls abruptly stops us in our tracks. Bey can make the mundane bewitching and gorgeous. He has the documentarian’s flair for making us feel we are present in the moment. Sometimes the moment is simply ravishing. Time stops, and we focus on beauty. The introductory text is tucked away. Admitting that the work is conceptual, it simply describes the show’s mission to imagine the Underground Railroad journey, a word-of-mouth operation that was never mapped in real time. Historians have tried to reconstruct it but it mostly existed in people’s heads. All of us have an Underground Railroad, a way out of something, imagined in our minds, while labyrinths have been seen as traps for evil forces since before recorded history. Bey takes an actual event and makes it universal. That is the beauty of his work and the show. 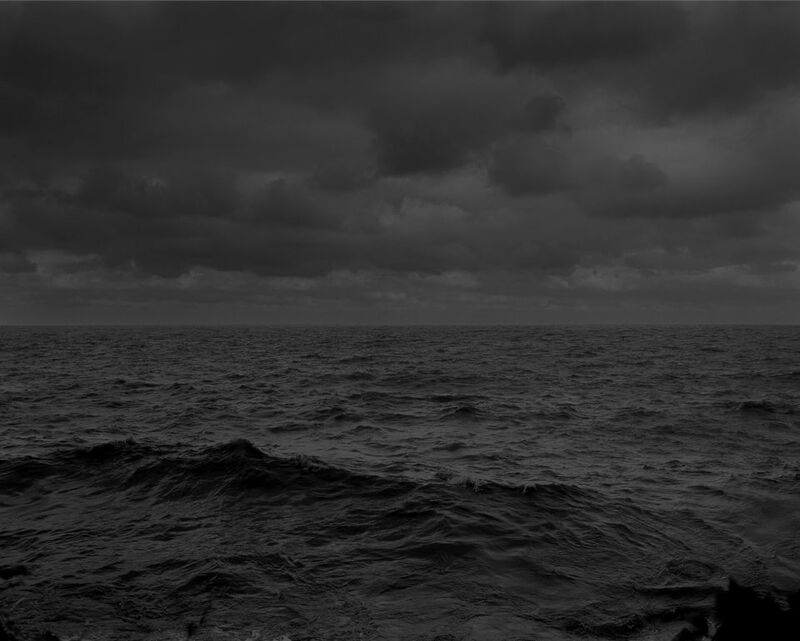 The show does not have a real sequence but, for me, the last image is a view of Lake Erie, dark, vast, and choppy. Most runaway slaves went to Canada, where slavery was abolished 30 years before it was in America, so crossing the water was the last leg. Most had probably never seen anything like Lake Erie. As far as they were concerned, it might as well have been the Red Sea, sans parting. By this point in the exhibition, we are engaged in the trip as witnesses, as freedom seekers, or as those offering succour. The show is installed in a gallery as hard white and bright as the inside of a refrigerator, however. Better lighting and a darker, saturated wall colour would have allowed the details and subtle grades of grey in the photographs to emerge. The stark setting does nothing to augment what are, after all, 19th-century scenes in mood if not in date. In an adjacent gallery, Bey has selected photographs from the Art Institute’s permanent collection by artists that inspire him. The display includes works depicting lynchings, beatings, Civil Rights leaders, and old plantation buildings, among other things. It is what I call an impressionist installation, with a tight hang of about 30 photographs meant to be seen as a coherent whole. There other ways to acknowledge Bey’s aesthetic and intellectual mentors, but that would have meant more and better space. And since it is the first thing visitor’s see, it might bring too many pre-conceived notions to Bey’s work. The curator has basically tipped the artist’s hand, and I wonder if that was the best thing to do. This gallery presents another odd note, as it shares space with the big wall text introducing an 88-minute film by Naeem Mohaiemen called Two Meetings and a Funeral, about Bangladesh’s early nationhood in the 1970s. It “mourns the erosion of a unified Third World — spanning Asia, Africa, Latin America, and the Middle East — as a space for decolonization, liberation theology, and socialism,” the introductory text states. Visually, this panel, about six feet from Bey’s selection of photographs and in the same gallery, confuses and distracts. They seem to collide. Are the two shows somehow related? Bey’s selection has no didactic wall text, so it is a bit of an intellectual jumble. In looking at Bey’s photographs and thinking about how good an artist he is, I remembered the list of new works the Baltimore Museum of Art is buying in its campaign to diversify its collection by race. The museum recently sold $10m in art to create a fund for this purpose. Most of the new works are by glitzy international artists who have African roots. I wonder if these will resonate at all with Baltimore’s large African-American population, which the museum wants to attract. Baltimore has only one work by Bey in its collection. The Underground Railroad was immensely important in Maryland’s antebellum and wartime history. Baltimore should do something that really would instruct and inspire its audience by buying Bey’s portfolio. He has a retrospective coming to the Whitney and SFMoMA next year, which could use a third venue.